The Environmental Working Group (EWG) recently released their 2011 Sunscreen Report, which rates more than 1,700 SPF products for safety and effectiveness. 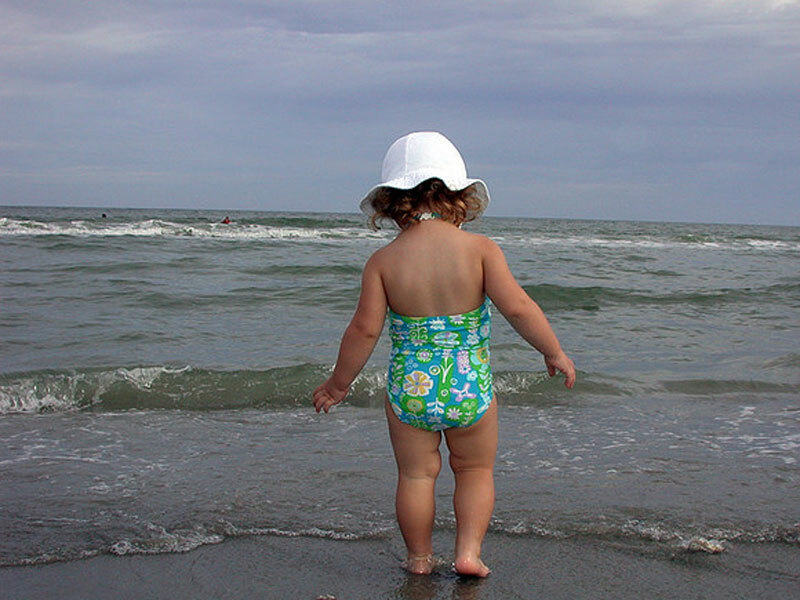 We scoured the list to find our 7 favorite sunscreens for babies and kids. EWG's expert team analyzed each product in five categories: Health hazards from ingredients, UVB protection, UVA protection, the balance of UVA and UVB protection, and stability, or how quickly sunscreens break down in the sun. We picked our top 7 from the EWG's top-rated children's and baby sunscreens, also favoring products with the lowest health hazard risk and best UVA and UVB coverage. Once you pick your potion, remember to apply sunblock generously 30 minutes before exposure, and reapply every two hours or more. Hats and sun protective clothing are also musts. Limit sun exposure between 10am and 4pm. Also, because the American Academy of Pediatrics recommends avoiding sunscreen on babies six months and under, keep them in the shade and dressed in protective clothing whenever possible. 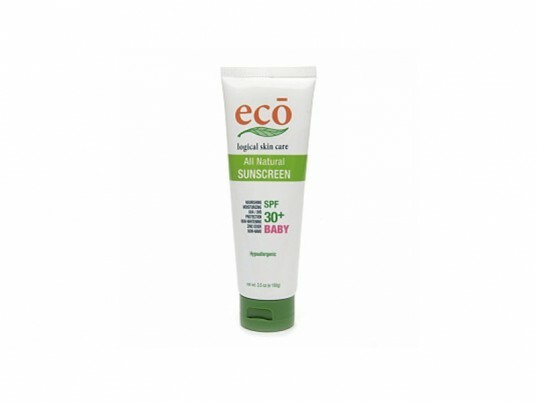 Eco Logical Skin Care’s Eco Baby SPF 30+ is gentle 22% zinc oxide sunscreen made for babies 6 months and old, but it’s also great for kids and adults. The biodegradable, non-toxic ingredients in this Australian import include Shea butter, jojoba oil, avocado and carrot oil. This cruelty free pick is a top choice for hitting the beach or pool because it’s water resistant. If you’re looking for an SPF above 30, Coola Baby sunscreen is your best bet, providing SPF 45 from titanium dioxide and zinc oxide. Though you shouldn’t get caught up in the “who has the highest SPF rating?” game. While sunscreen manufacturers are touting 70 and 100+ SPF ratings, 30 to 45 will protect you sufficiently, and regardless of SPF, you need to reapply every two hours. This mineral sunblock is safe for babies 6 months and up and also great for super sensitive skin. The formula is 80% organic with several organic oils, extracts and butters. One note, even though this sunscreen offers the best UVB protection of the bunch earning the only “excellent” rating, that supreme protection does come from smaller zinc oxide nano-particles that EWG considers to be more of a risk. Here the nano-particles are less than 100 nm, while all others are greater than 100 nm. Smaller nano-particles are better absorbed by the skin and don’t leave a white residue behind, but larger ones may be safer. Even though lotion is the best way to cover your tot from head to toe, a SPF stick can make reapplying sunscreen on the go so much easier! That’s why we love TruKid’s Sunny Days Face & Body Stick. Buy the 3-pack: Keep one in your car, one in your diaper bag, and one in your purse. That way whenever you realize you’re kids nose, cheeks, shoulders, knees or toes have been in the sun too long, a swipe of this fragrance-free, all-natural, mineral sunblock will save the day (and their skin) with titanium dioxide and zinc oxide protection. Reef safe and biodegradable. This Health Canada approved, certified organic sunscreen battles the sun with 21% zinc oxide. The formula is non-whitening, non-nano, fragrance-free and as water-resistant as a sunscreen can be. Canadians are crazy for this chemical-free, biodegradable sunscreen for kids, but because Green Beaver is a Canadian brand, you won’t have an easy time finding this sunscreen in US stores. Luckily, there is limited availability online. 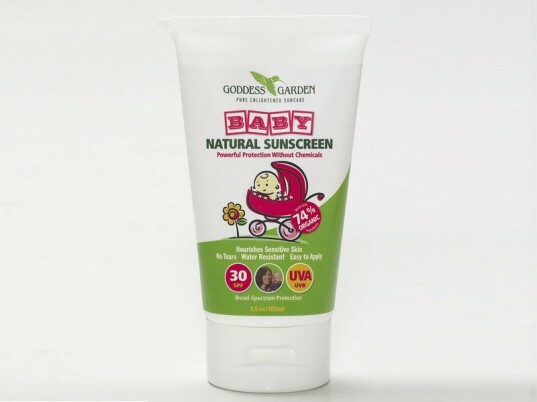 Goddess Garden’s 74% organic baby sunscreen is another top choice for the sensitive skin and your youngest SPF wearers. The water-resistant formula helps to block the sun with 20% zinc oxide and promises to nourish baby soft skin with vitamin E, aloe vera and jojoba oil. This made-in-the-USA sunscreen is also 100% vegan, reef safe, and cruelty free. 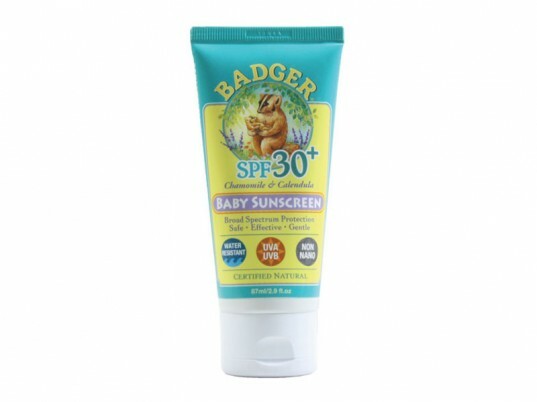 Badger‘s sunscreen and other body care products have been a favorite of ours and EWG-approved for years. The 18.7% zinc oxide formula protects from the sun’s rays and it’s water-resistant so a good option for bobbing around in the pool or ocean. This baby sunscreen is Certified Natural by the Natural Products Association and contains organic oils and beeswax. While this sunscreen isn’t fragrance-free, it’s milk scent comes from chamomile and calendula. Thinkbaby‘s company mission is to target consumer product areas that have known human health issues, and they’ve previously launched a BPA-free baby feeding line and baby bottles. Now they’ve targeted the sunscreen category with their zinc oxide-based formula that passed EWG’s sunscreen analysis with flying colors. It was also the first sunscreen to pass Whole Foods Premium Care line requirements. You can’t get much better than this chemical-free, fragrance-free, water-resistant sunscreen for your family. Thanks for making your readers aware of chemical-free sunscreens. They're the safest protection for children's delicate skin or anyone with sensitive skin. As I pediatric dermatologist, I find the biggest mistake people make when applying sunscreen is not using enough, so wear sunscreen every day and don't be shy...re-apply. I can't believe I never heard of ANY of these baby sun tan lotions. Protecting my baby (2 years old) and older children are very important to me, but at these prices, I am not sure I can maintain them for the entire summer...One bottle does not last that long....but, thank you for this, I will try to find the best places to purchase them. I appreciate this detailed blog about the 7 best lotions out there. Eco Logical Skin Care's Eco Baby SPF 30+ is gentle 22% zinc oxide sunscreen made for babies 6 months and old, but it's also great for kids and adults. The biodegradable, non-toxic ingredients in this Australian import include Shea butter, jojoba oil, avocado and carrot oil. This cruelty free pick is a top choice for hitting the beach or pool because it's water resistant. If you're looking for an SPF above 30, Coola Baby sunscreen is your best bet, providing SPF 45 from titanium dioxide and zinc oxide. Though you shouldn't get caught up in the "who has the highest SPF rating?" game. While sunscreen manufacturers are touting 70 and 100+ SPF ratings, 30 to 45 will protect you sufficiently, and regardless of SPF, you need to reapply every two hours. 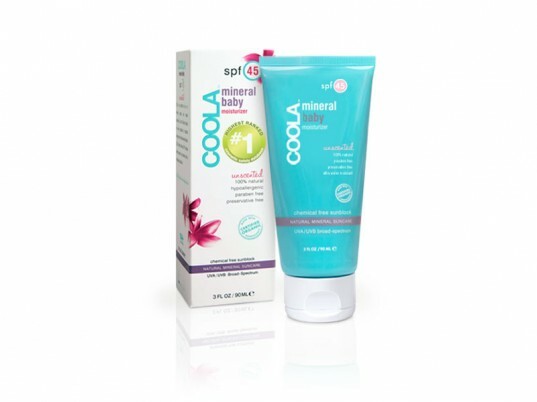 This mineral sunblock is safe for babies 6 months and up and also great for super sensitive skin. The formula is 80% organic with several organic oils, extracts and butters. One note, even though this sunscreen offers the best UVB protection of the bunch earning the only "excellent" rating, that supreme protection does come from smaller zinc oxide nano-particles that EWG considers to be more of a risk. Here the nano-particles are less than 100 nm, while all others are greater than 100 nm. Smaller nano-particles are better absorbed by the skin and don't leave a white residue behind, but larger ones may be safer. Even though lotion is the best way to cover your tot from head to toe, a SPF stick can make reapplying sunscreen on the go so much easier! 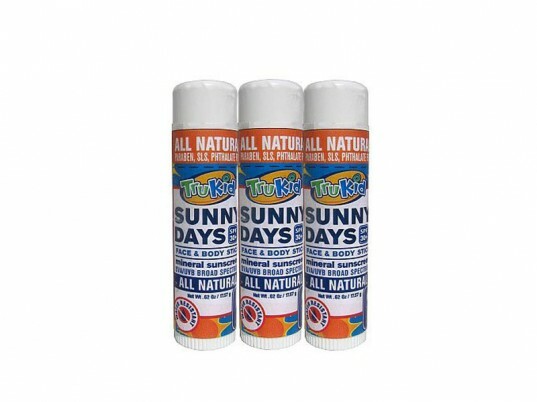 That's why we love TruKid's Sunny Days Face & Body Stick. Buy the 3-pack: Keep one in your car, one in your diaper bag, and one in your purse. That way whenever you realize you're kids nose, cheeks, shoulders, knees or toes have been in the sun too long, a swipe of this fragrance-free, all-natural, mineral sunblock will save the day (and their skin) with titanium dioxide and zinc oxide protection. Reef safe and biodegradable. This Health Canada approved, certified organic sunscreen battles the sun with 21% zinc oxide. The formula is non-whitening, non-nano, fragrance-free and as water-resistant as a sunscreen can be. 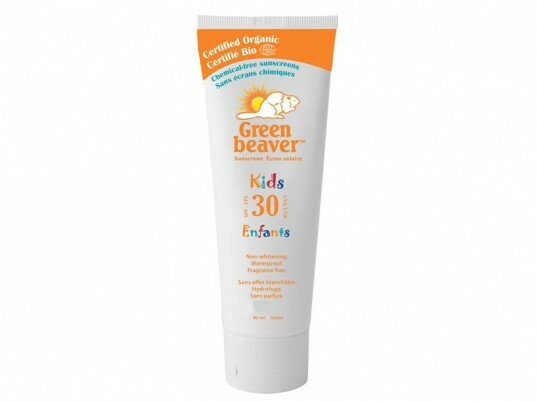 Canadians are crazy for this chemical-free, biodegradable sunscreen for kids, but because Green Beaver is a Canadian brand, you won't have an easy time finding this sunscreen in US stores. Luckily, there is limited availability online. Goddess Garden's 74% organic baby sunscreen is another top choice for the sensitive skin and your youngest SPF wearers. The water-resistant formula helps to block the sun with 20% zinc oxide and promises to nourish baby soft skin with vitamin E, aloe vera and jojoba oil. This made-in-the-USA sunscreen is also 100% vegan, reef safe, and cruelty free. Badger's sunscreen and other body care products have been a favorite of ours and EWG-approved for years. The 18.7% zinc oxide formula protects from the sun's rays and it's water-resistant so a good option for bobbing around in the pool or ocean. This baby sunscreen is Certified Natural by the Natural Products Association and contains organic oils and beeswax. While this sunscreen isn't fragrance-free, it's milk scent comes from chamomile and calendula. Thinkbaby's company mission is to target consumer product areas that have known human health issues, and they've previously launched a BPA-free baby feeding line and baby bottles. Now they've targeted the sunscreen category with their zinc oxide-based formula that passed EWG's sunscreen analysis with flying colors. It was also the first sunscreen to pass Whole Foods Premium Care line requirements. You can't get much better than this chemical-free, fragrance-free, water-resistant sunscreen for your family.